Gritty released his bracket for March Madness this week. As he's done every year since 2009, Barack Obama has revealed his picks for the NCAA basketball tournaments on Thursday. And perhaps less importantly — or more importantly, depending on your political preference — Gritty released his, too. Among his 2019 March Madness selections, Obama chose Duke, North Carolina, Michigan, and Tennessee to reach the men's Final Four this year. For the women's tournament, the former president has Baylor, Notre Dame, Mississippi State, and UConn. In the end, Obama went with Duke (a pretty safe bet) as the men's champs and UConn to win the women's title. Gritty's selections include a few unexpected and confusing choices. In his Final Four, he's got Villanova making it to a matchup with 16th seed Gardner-Webb and then, surprisingly, the Wildcats losing to Gardner-Webb. He also chose the University of Phoenix *online* and Lady Gaga as winners in the west. In the end, he's got Duke winning the entire tournament, but also "LOVE Always Wins." 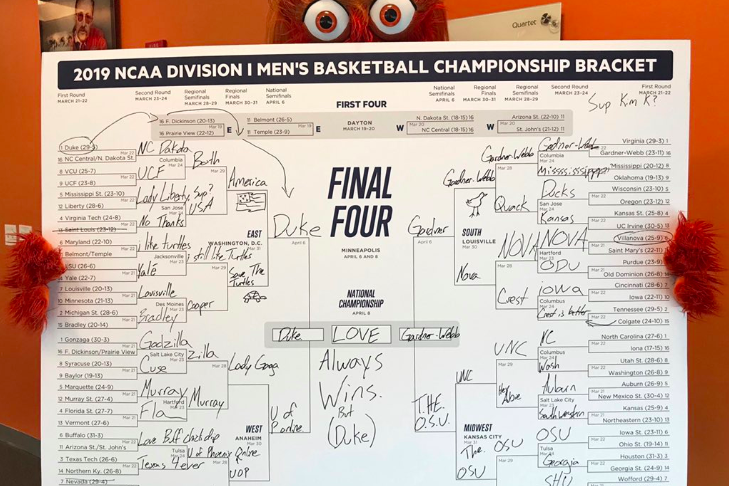 We're not entirely sure if Gritty knows what a bracket is. He didn't fill in a lot of the matchups and drew pictures for some of them. Between Iowa and Colgate, Gritty chose Crest toothpaste to win? It's OK, buddy. You tried.